Congratulations to "Liz D." the winner in Laura's giveaway. Thank you to all who participated! Evenings were the hardest, the time when everything unraveled. Catie’s mind overflowed, her chest felt empty, and the craving dug into her with razor-sharp claws. Her shoulders tensed as she pulled into the park. All her life, she’d been addicted to work and approval and success. Now she was simply an addict. Her high-performance tires glided over the ruts, absorbing the bumps as she eased along the drive. She turned into the gravel parking lot and swung into a space. Forty-six days. Resting her head on the wheel, she squeezed her eyes shut. Her throat tightened, and she fought the burn of tears. “One day at a time,” she whispered. She sat up and gazed through the windshield. She’d never thought she’d be one of those people who gave themselves pep talks. She’d never thought she’d be a lot of things. Yet here she was. Catie shoved open the door and popped the trunk. She tossed her purse inside, then rummaged through her gym bag, looking for her iPod. On second thought, no music. She slammed the trunk closed, locked the car, and tucked the key fob into the zipper pocket of her tracksuit. She leaned against a trail marker and stretched her quads. A few deep lunges and she was ready to go. She set off at a brisk pace, quickly passing the dog walkers and bird enthusiasts who frequented the trail. Her muscles warmed. Her breathing steadied. She passed the first quarter-mile marker and felt the tension start to loosen. The routine had become her lifeline. She registered the familiar scent of loblolly pines, the spongy carpet of pine needles under her feet. She put her body through the paces, then her mind. It was Wednesday. She was halfway through the week, another daunting chain of days that started with paralyzing mornings in which she had to drag herself out of bed and force herself to shower, dress, and stand in front of the mirror to conceal the evidence of a fitful night. Then she faced the endless cycle of conference calls and meetings and inane conversations as the secret yearning built and built, culminating in the dreaded hour when it was time to go. Time to pack it in and head home to her perfectly located, gorgeously decorated, soul-crushingly empty house. But first, a run. Or a spin class. Or both. Anything to postpone the sight of that vacant driveway. Catie focused her attention on the narrow trail. Thirst stung her throat, but she tried to clear her mind. Rounding a bend, she noted the half-mile marker. She was making good time. Another curve in the path, and she came upon a couple jogging in easy lockstep. Twenty-somethings. At the end of the trail, and still they had a bounce in their stride. The woman smiled as they passed, and Catie felt a sharp pang of jealousy that drew her up short. She caught herself against a tree and bent over, gasping. Shame and regret formed a lump in her throat. She dug her nails into the bark and closed her eyes against the clammy onset of panic. Don’t think, Catie, Liam’s voice echoed in her head. Be in the moment. God, she missed him. Liam was way too smart and way too intense, and he didn’t know how to turn it off. And she liked that about him. So different from David. He knew evil lurked in the world, and he faced it head-on, refusing to look away, even relishing the fight. Catie’s head jerked up. She swung her gaze toward the darkening woods as awareness prickled to life inside her. The forest had gone quiet. No people, no dogs. Even the bird chatter had ceased. She glanced behind her, and a chill swept over her skin. Look, Catie. Feel what’s around you. She did feel it. Cold and predatory and watching her. David would tell her she was paranoid. Delusional, even. But her senses were screaming. She glanced around, trying to orient herself on the trail. She wasn’t that far in yet. She could still go back. She turned around and walked briskly, keeping her chin high and her gaze alert. Strong. Confident. She tried to look powerful and think powerful thoughts, but fear squished around inside her stomach, and she could feel it—something sinister moving with her through the forest, watching her from deep within the woods. She’d felt it before, and now it was back again, making her pulse quicken along with her strides. I am not crazy. I am not crazy. I am not crazy. But . . . what if David was right? And if he was right about this, could he be right about everything else, too? A sound, directly left. Catie halted. Her heart hammered. She peered into the gloom and sensed more than saw the shifting shadow. Her stomach plummeted. All her self-doubt vanished, replaced by a single electrifying impulse. Laura will be giving away a signed copy of any previous title from the Tracers series. Giveaway ends 11:59pm EST Sept. 28th. Please supply your email in the post. You may use spaces or full text for security. (ex. jsmith at gmail dot com) If you do not wish to supply your email, or have trouble posting, please email maureen@justromanticsuspense.com with a subject title of JRS GIVEAWAY to be entered in the current giveaway. I've been seeing good reviews of this title and of the series in general. I'm looking forward to tackling this series. Thanks so much! Hope you like SHADOW FALL. I love the Tracers series! I have all of the Tracers series except for the last two releases. Thank you for the chance. 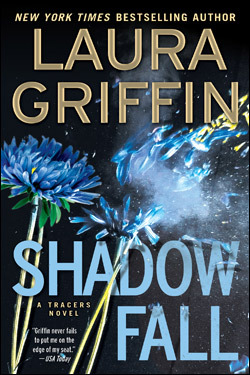 Hi Rachael, Glad you are liking the Tracers series! I love writing the stories. Hi Erin, Thank you! Hope you will like the new book. Thanks for stopping by JRS. Hi Laura, from your excerpt, your book sounds exciting. And, great cover. Thanks, Janet. I love this cover, too. I have some catching up to do in this series... I loved the ones I already read! Thanks for sharing! Hi Colleen, thank you for reading the Tracers! Thank you! Hope you like SHADOW FALL. A fabulous read through thank you. I love romantic suspense books,this series sounds fantastic! Huge fan of your Laura :) Had this book on pre-order the second I saw it coming out, lol. I love romantic suspense and add an ex-marine and Special Agent, I'm hooked. Shadow Fall sounds great! I've added it to me TBR list so I can find out how Liam and Tara figure out who the murderer is and how they get together.